SECURE YOUR OWN FREEDOM, PRIVACY & WEALTH the PT Way! 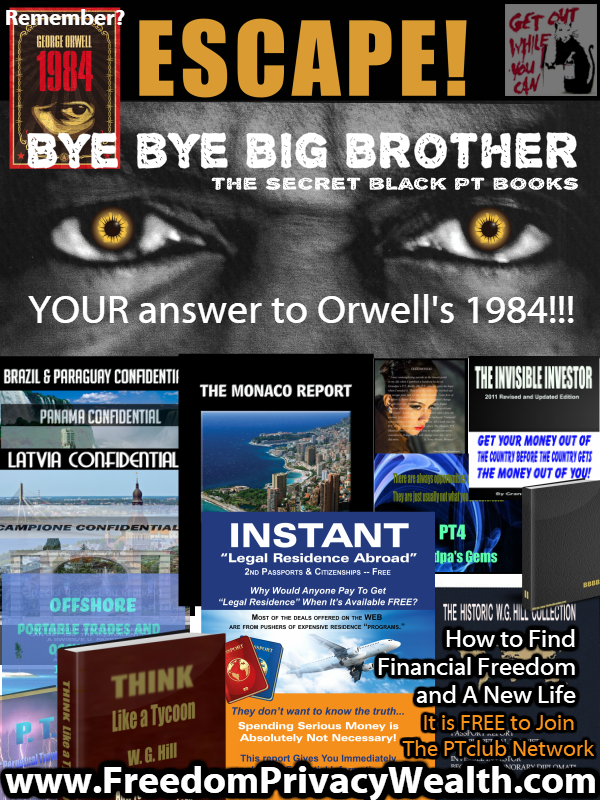 - The PT Refuge & PTclub @ PTsecrets Web @ www.FreedomPrivacyWealth.com To Predict the Future - You Have to Know the Past! Do You Want To Join a Multi-Millionaire's Inner Circle? For over 50 years our expertise has been sought & bought both by Multi-Millionaires and middle-class people -- like you. Take Charge of Your Life! 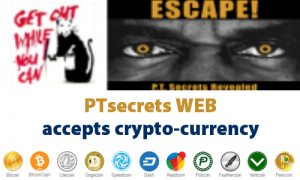 Secure Your Own Freedom, Privacy & Wealth the PT Way! The sale of George Orwell’s ‘1984’ Book (Big Brother is Watching YOU) has skyrocketed. Why? Because of Snowdon’s recent disclosure: NSA records every communication in the world. Maybe you can’t totally avoid surveillance, but you can stay below the radar. Our “reports for people who don’t read books,” include: Bye Bye Big Brother and ESCAPE! They show you how to regain your privacy. People realize that Big Brother’s Eye In The Sky already has enough information to kidnap, torture or send anyone to prison for life. Is it time for you to drop out of the system and say Bye Bye Big Brother? Grandpa’s books and reports will show you ways to secure your life. How to protect you and your family. Learn why and how you should keep a low-profile and stay under the radar.